Jambeaux, everyone!!! Harambe! Danny and Eli discuss their recent experiences with Mickey’s Not So Scary Halloween Party in October 2017. We also hear the Roberge’s account of the event. This is our 2017 Halloween Special! 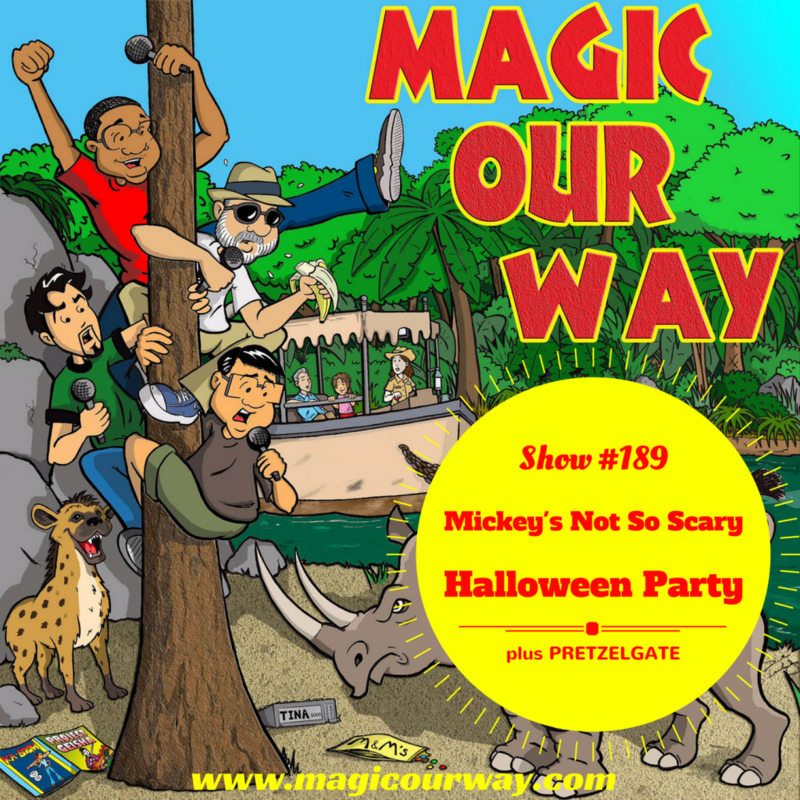 For this episode, Danny and Eli discuss their recent experiences with Mickey’s Not So Scary Halloween Party for October 2017. Joining them on this show, unbeknownst to them, is Josh and Rachel Roberge who also experienced this event this year. This is our 2017 Halloween Special! What did you think about our discussion? Any comments? We would love to hear your account of Mickey’s Not So Scary Halloween Party. Share them at show@magicourway.com. Your opinions are always welcome on our show. Jambeaux, everyone!!! Harambe! On this episode, we discuss more details about Danny and Eli’s recent trip to Walt Disney World. Yes, we talk about all things WDW, but mostly the food. It’s all about the food. Today, we recognize the listener, or listeners as it were, the JEM Sessionz: Justin, Emily, and Madison. For this email, we address the common man as well as Lee’s sound quality. For this episode, we discuss the aspects of Danny and Eli’s recent trip to Walt Disney World in October 2017. We discuss the following topics…I lied. We mostly talk about food. It’s all about the food!!! What did you think about our discussion? Any comments? Share them at show@magicourway.com. Your opinions are always welcome on our show. Jambeaux, everyone!!! Harambe! On this episode, we present our very first MOW LIVE show. We finally got the technology setup for all four of us to be feature on Facebook Live. For our very first live show, we have Danny and Eli’s field report from their vacation in Walt Disney World in October 2017. On today’s show, we have Kevin, Danny, Eli of www.ivorycomics.com, and Lee of Magical Moments Vacations. We also welcome those MOWicans that joined us on a late Saturday night. For this show, we present our very first MOW LIVE show. We finally caught up with the rest of the podcasting world and got the technology to start doing live shows. So, be sure to follow us on social media, so that you know when we are going live. For our first live show, we present Danny and Eli’s Field Report from their Walt Disney World trip in October 2017. We discuss the following topics. Tiffins and their awesome waiter, Cam. Saratoga Springs, deluxe or not? A word of caution: you will hear some extraneous sounds including Lee’s breathing. But, as we learn better microphone etiquette, the sound quality of our live shows will improve. Jambeaux, everyone!!! Harambe! For this show, we welcome back our Friend of the Fur, Peter, to the show. This is part two! He addresses our questions regarding the story of the stormtrooper, the irate, middle-aged guest, and the poor, unsuspecting custodial castmember. Check out the Guest Services segment on MOW #183 regarding that particular story. Plus, we have some guest services and a listener trip report. On today’s show, we have Kevin, Danny, Eli of www.ivorycomics.com, and Lee of Magical Moments Vacations. We also welcome guest host, Peter. In this segment, we recognize MOWican Tommy Nelson and his wife, Kourtney. They recently got married and we offer them some marriage advice. Feel free to submit your own thoughts regarding marriage via email or voicemail. Tommy is not only a listener, but he is a member of the MOWican Fantasy Football League. On this segment, we chat with Stephen Downs, another MOWican who recently got married as well. For his honeymoon, he travelled to Walt Disney World. At the same time, Hurricane Irma decided she wanted to go to Walt Disney World as well. Even though Lee was able to secure a flight out, the airline ultimately had to cancel their plane tickets and the newlyweds had to ride out the storm at friend;s house in the WDW area. Stephen is from the West Coast and his main park is Disneyland. This was his first visit to WDW. Hear his initial thoughts as he compares Walt Disney World and Disneyland. Also, we discuss how Disney handled his particular situation during the hurricane. On this episode, we welcome back Peter to address a question brought up by Steve Kinsman’s story regarding the stormtroopers, the irate, middle-aged woman, and the poor, unsuspecting custodial castmember. Be sure to check out this story on MOW #185.